Using only the highest quality ingredients, The Pittsburgh Juice Company (PJC) creates fresh, organic cold-pressed juices, small batch superfood smoothies and high-performance snacks. Since their founding in 2013 PJC has consistently grown its revenue, its production capacity, and its reach. 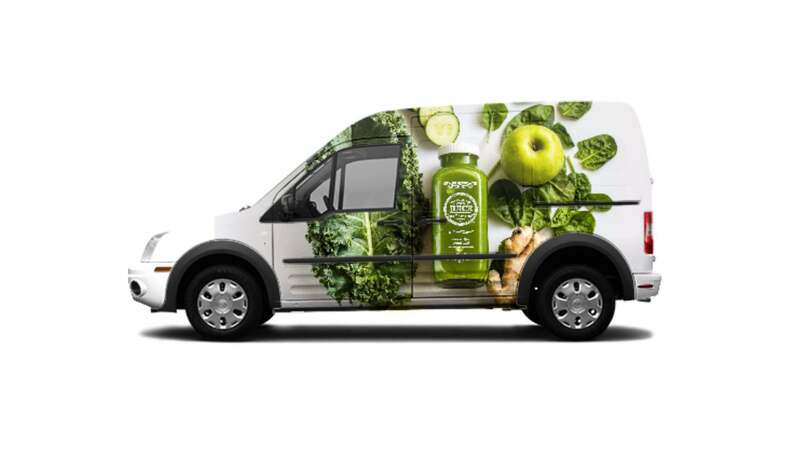 Now the business is looking to purchase a delivery truck to make its fresh, organic products more widely available in the Pittsburgh area. The Pittsburgh Juice Company’s flagship store and commissary are located in the bustling neighborhood of Lawrenceville. In recent months, PJC has built partnerships with local cafes where they sell their products. PJC also sells juice directly to professional sports teams and local corporations. In 2018 The Pittsburgh Juice Company plans to use the refrigerated vehicle to deliver to three remote locations, participate in two additional farmers markets, deliver to a local sports team, and service a new storefront. PJC believes, this alone could generate over $150k in additional sales. Any additional money raised from this campaign will go to working capital. Below are four potential design mock-ups for the branded wrap. Siblings Naomi and Zeb Homison were raised in a health-conscious vegetarian household in rural Pennsylvania at a time when vegetarianism was not a widely accepted, nor well-understood phenomenon. "As a child, I took our healthy lifestyle for granted, along with the whole, unprocessed, nutritious foods that were always on my plate," reflects Naomi. Through their separate life experiences and world travels, Naomi and Zeb each found their way to a primarily raw and plant-based diet for one simple reason. As Naomi puts it, "When you eat well, you feel good. Juicing is the epitome of this. After drinking a green juice I feel like I can take on the world." Finding themselves back in Pittsburgh, Naomi and Zeb were happy to introduce a raw cold-pressed juice culture to their hometown, which over the past decade had become more accepting of fresh foods and beverages that didn’t include a topping of French fries. With their flagship store adjacent to Zeb's yoga studio, The Pittsburgh Juice Company acts as a catalyst and hub for health and wellness in Pittsburgh. Having blossomed from a community of health-focused yoga practitioners and teachers, PJC holds education and community interaction as principle objectives, striving to provide resources, seminars, and experiences to foster the development of healthy lifestyles. PJC’s products were developed for the enjoyment and benefit of individuals who don’t have the knowledge, know-how or time to make their own juice or smoothies at home. At PJC the customer can always trust that products are made conscientiously with whole, organic, vegan ingredients in small, concise batches. From a modest beginning of seven juice flavor offerings, PJC has slowly grown to offer more than 70 fresh products, all made in-house daily with the same quality and consistency that came from the tiny kitchen where the company began. The flagship store is located in a central location with reliable hours, ensuring availability of products that customers can rely upon. With the added resource of a refrigerated truck, PJC will be able to provide even more reliable outlets for its growing inventory of products. 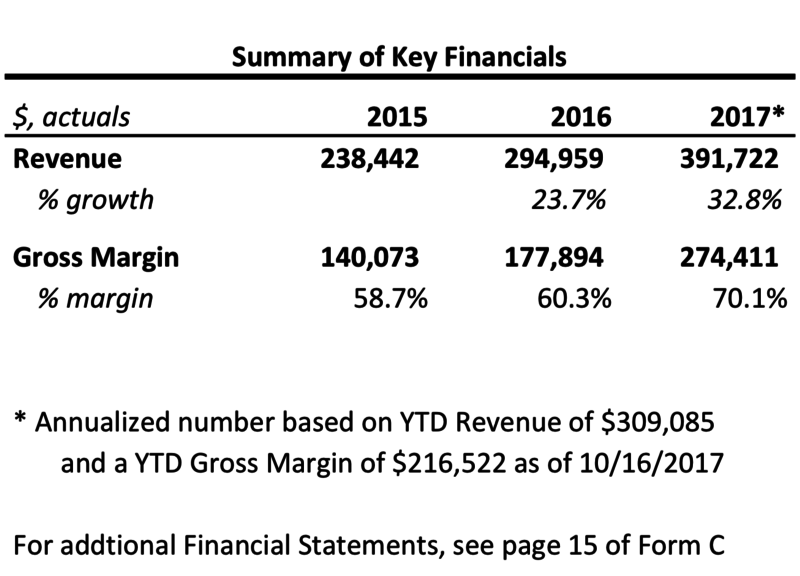 PJC has shown year-over-year revenue growth and margin expansion. PJC believes that this new truck will drive future growth as it gives them access to new customers and territories. Recently established relationships with new customers have already led to new revenue streams this year. The delivery truck will help service these relationships and allow PJC to forge additional sales relationships. *Annualized number based on one month of operation. 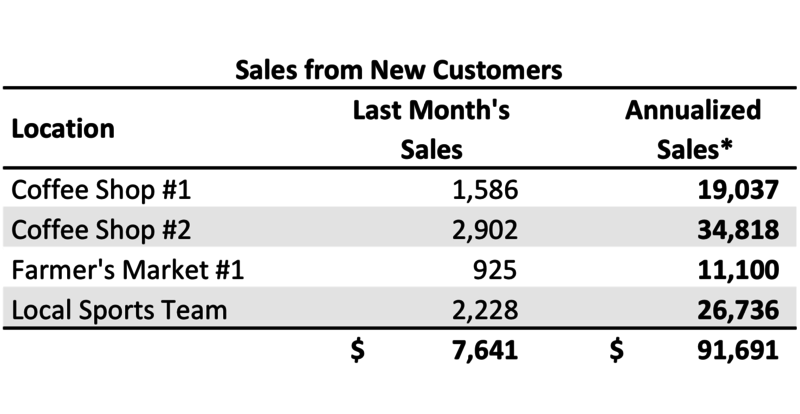 Actual sales number may vary. For additional information and further review of our company's financials, please see our 'Form C' located in the "Investor Info" tab. Pittsburgh's Lawrenceville neighborhood has been undergoing a major transformation. New restaurants, nightlife, and attractions have opened in the area, making it into one of Pittsburgh’s most vibrant neighborhoods. The Pittsburgh Juice Company occupies two previously vacant spaces in the neighborhood (one as a storefront and one as a commissary) and is proud to play a part in the neighborhood revitalization by employing local residents, fostering community and offering fresh, healthy products to the diverse residents. Naomi holds a BArch and MArch from Tulane University. While architecture is not directly related to juice, Naomi pulls from her rigorous education in many ways. Architecture school instilled in her a strong attention to detail and quality of design, which she applies to PJC’s branding, product development, marketing, website development and physical spaces. Naomi’s education also afforded her a greater understanding of how large systems are planned, developed and integrated, which has been instrumental in her ability to create and implement the processes and procedures PJC relies upon. After university, Naomi spent three years as a Peace Corps Volunteer in rural Peru, where she learned many things, but most notably: how to engage a community to successfully execute projects that she didn’t necessarily feel prepared for. Back stateside, Naomi spent one year, prior to opening the juice company, working for Alcoa as a project manager with an focus on systems and process improvement. As a business owner, Naomi brings all of these experiences with her and continues to learn and grow on the job every day. An experienced entrepreneur and promoter of wellness, Zeb has been a part of many successful businesses and real estate ventures. His extensive travels as a yoga instructor have allowed him to experience how other cultures maintain and heal the human body and mind. After completing an intensive, nine-week teacher training with Bikram Choudhury in Honolulu, Hawaii, Zeb set out to travel and bring the gift of yoga to as many people and places as possible. This journey took him throughout the United States, Australia, Europe, Southeast Asia, and to the beaches of Mexico. From 2008 to 2014, Zeb’s dedication to his yoga practice allowed him to consistently place among the top four competitors in the USA Yoga National Finals. In 2014 he was named the USA National Champion and, later that year, International Champion. Along with a deep knowledge of yoga technique, Zeb holds a BFA in Theater Arts from the University of the Arts in Philadelphia. His premier yoga school, Yoga Factory Pittsburgh, is closely associated with The Pittsburgh Juice Company’s flagship store in Lawrenceville. Samantha’s passion for nutrition as a mechanism to heal the body is what drew her to The Pittsburgh Juice Company as a customer, who quickly became PJC’s first social media marketing intern. These days, Sam plays many roles at PJC, acting as an ambassador at community events, executive chef at PJC’s raw vegan dinner parties and, as one of PJC’s certified food safety managers, she helps out around the store and commissary. Sam often turns to juice and nutrition to help resolve her own health issues and she is driven by a desire to share what she has experienced with others. Sam is a 200 hour certified power vinyasa instructor who loves to practice and teach yoga. Having just completed her BS in Psychology from the University of Pittsburgh, Sam will be spending more time around PJC, expanding the impact of her role as Community Relations Manager. If you invest, you will make a one-time investment that will be transferred to a secure escrow account. Once the campaign successfully reaches its target, the funds will be distributed to The Pittsburgh Juice Company. After two payment and interest-free months to purchase the truck and get it on the road, The Pittsburgh Juice Company will begin making monthly payments, which will be distributed back to investors each quarter. *Includes principal and interest, does NOT include fees and transaction costs. (Note: Returns are not guaranteed and investors could lose some or all of their investment) These amounts are calculated as a fully amortizing loan: principal and interest are paid down starting with the first payment. Your ongoing responsibilities are limited to receiving a 1099-INT each year. This is a simple tax document similar to what you receive for most savings accounts. When The Pittsburgh Juice Company pays as agreed, you will receive quarterly payments directly into your bank account along with a short update from the team. In the unlikely event of a default, you will be asked to elect a representative to manage the collections process on your behalf. Honeycomb charges The Pittsburgh Juice Company a 2.0% loan origination fee if this campaign is successfully funded. Our origination fee is reduced and our posting fee is waived for The Pittsburgh Juice Company because they are a founding partner. Additionally, Honeycomb charges a 2.85% investment fee capped at $10 per investor. Please enter your question below. 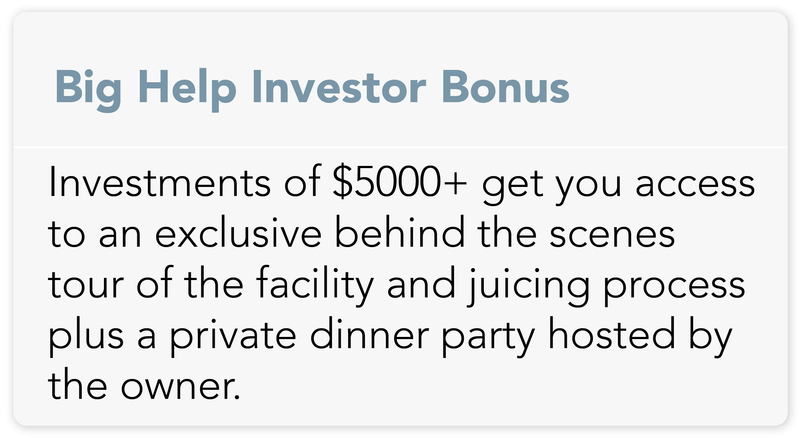 You will receive an email notification when the answer is posted to the Q & A tab of this investment. I have a relationship with this company or am being compensated to promote this investment. Regulations require any person posting a comment or question to disclose with each posting whether he or she is a founder or an employee of the issuer engaging in promotional activities on behalf of the issuer, or receives compensation whether in the past or prospectively to promote this offering.